Suprascapular nerve entrapment is responsible for a small amount of cases of shoulder pain and is therefore easily overlooked as a cause. It usually occurs in those people doing overhead activities. Athletes and patients with rotator cuff tears are at higher risk for these problems. Suprascapular nerve entrapment may also occur as the result of wearing heavy backpacks. The nerve is compressed as is traverses a small area of bone called the suprascapular notch. The suprascapular nerve provides innervation to the supraspinatus and infraspinatus muscles as well as is responsible for sensation from about 70% of the shoulder. It can be injured by repetitive trauma, compression or stretching during activities. 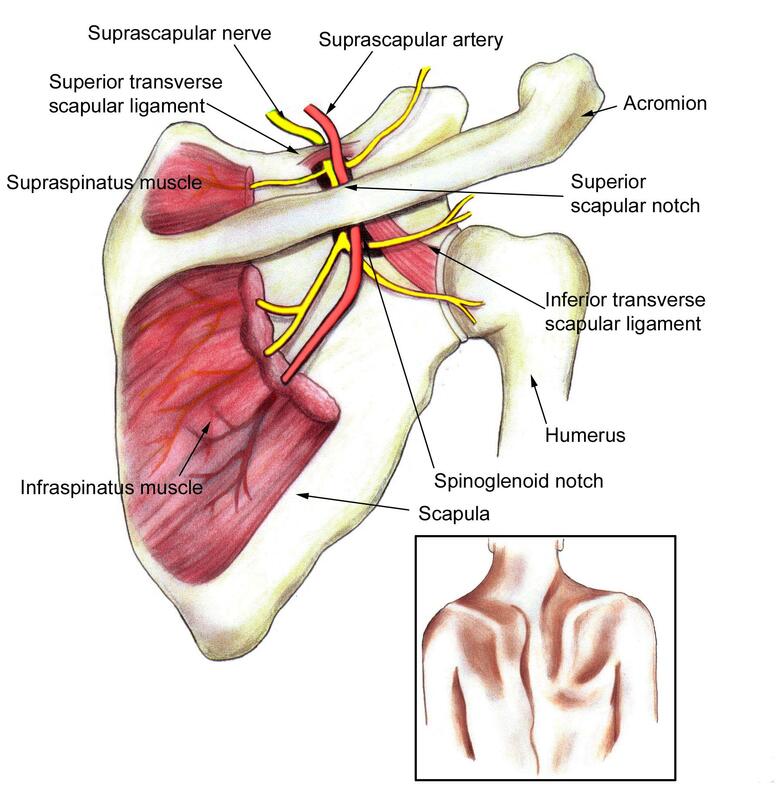 Suprascapular nerve entrapment can present with a dull, aching pain in the shoulder. The pain may be worsened by doing overhead activities with the shoulder. Entrapment of the nerve may also present with muscle weakness alone without pain. Suprascapular nerve entrapment may be confused with cervical disc disease, shoulder problems such as bursitis and tendinitis, as well as rotator cuff tears. X-rays are useful to look for fractures. MRI of the shoulder can look for shoulder pathology such as rotator cuff tears. Electromyography and Nerve Conduction Studies can test for intrinsic muscle problems and look for nerve damage. Initial treatment of suprascapular nerve entrapment is conservative and includes physical therapy and non-steroidal anti-inflammatory medications. Injections into the suprascapular notch with a dilute solution of a local anesthetic and steroid may decrease pain and inflammation of the nerve and aid physical therapy.